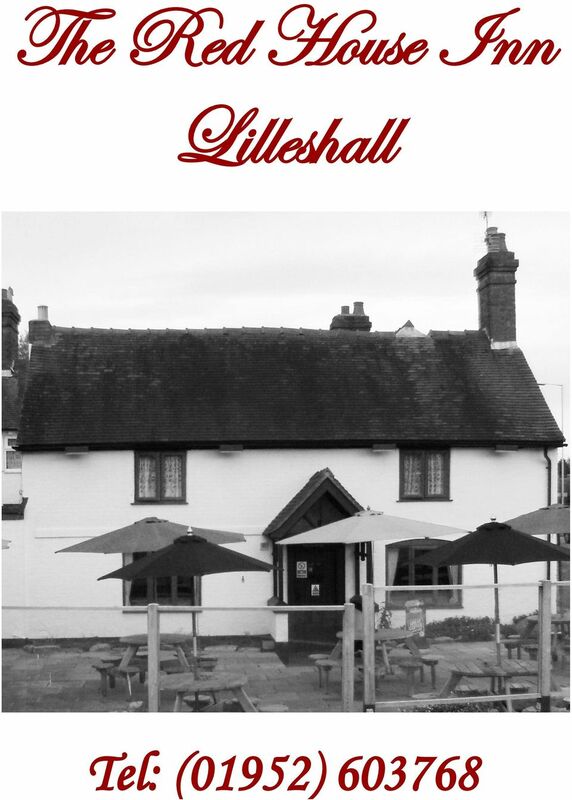 Download "The Red House Inn Lilleshall"
2 Welcome to The Red House Inn The Red House Inn is a traditional pub comprising of a large dining area offering home cooked meals, Traditional Ales, a cosy bar area and a large patio area. 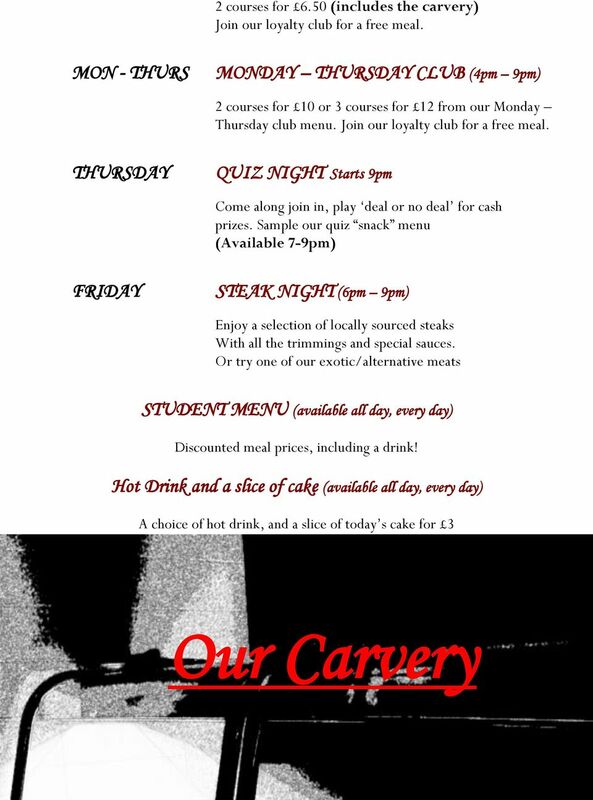 We offer a carvery every lunchtime, as well as an extensive menu and special boards. 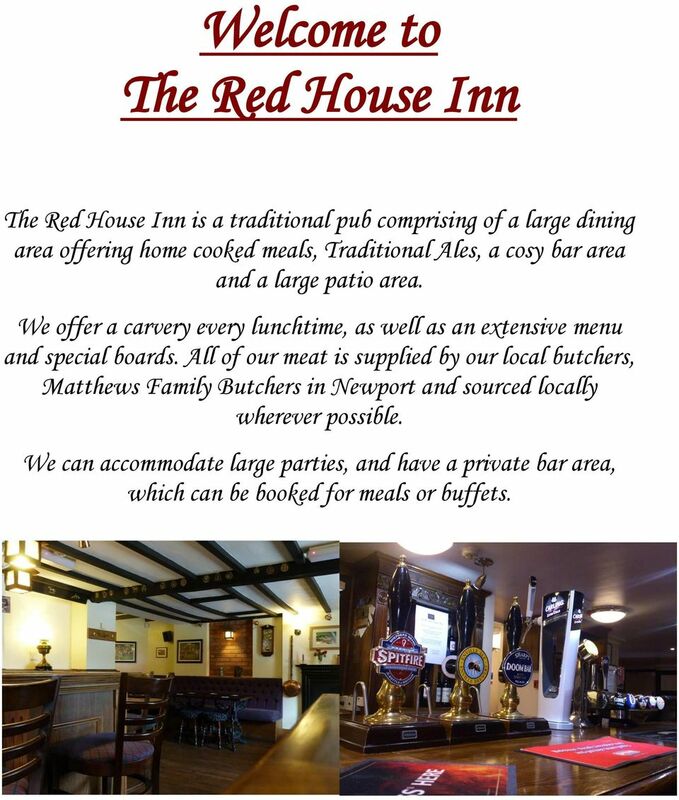 All of our meat is supplied by our local butchers, Matthews Family Butchers in Newport and sourced locally wherever possible. We can accommodate large parties, and have a private bar area, which can be booked for meals or buffets. 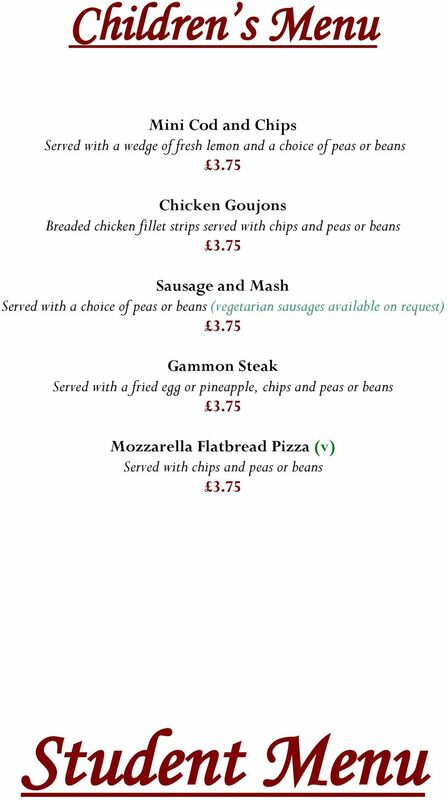 6 Side Orders Chips Onion Rings Side Salad Mixed Vegetables 1.95 Mushrooms Gravy Cheesy Garlic Bread Garlic Bread White Bloomer Bread (v) These dishes are suitable for vegetarians. 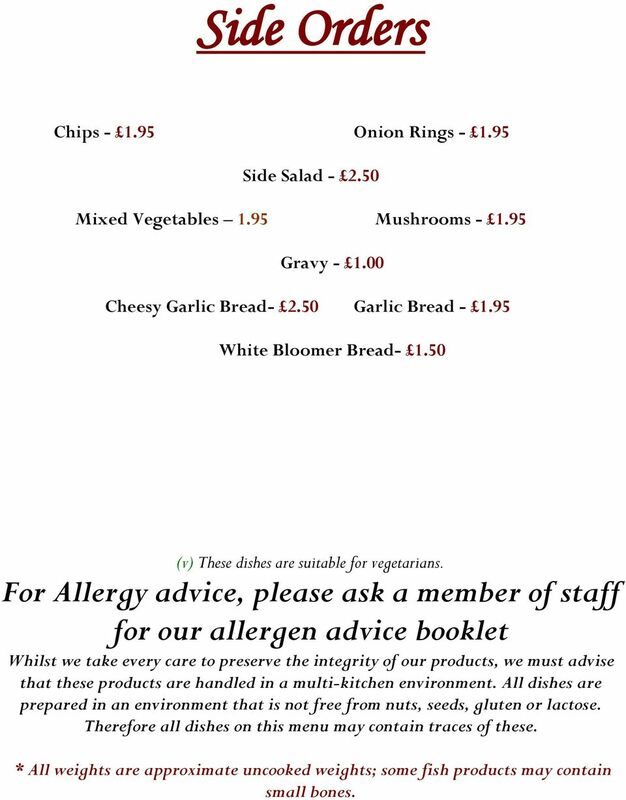 For Allergy advice, please ask a member of staff for our allergen advice booklet Whilst we take every care to preserve the integrity of our products, we must advise that these products are handled in a multi-kitchen environment. All dishes are prepared in an environment that is not free from nuts, seeds, gluten or lactose. Therefore all dishes on this menu may contain traces of these. * All weights are approximate uncooked weights; some fish products may contain small bones. 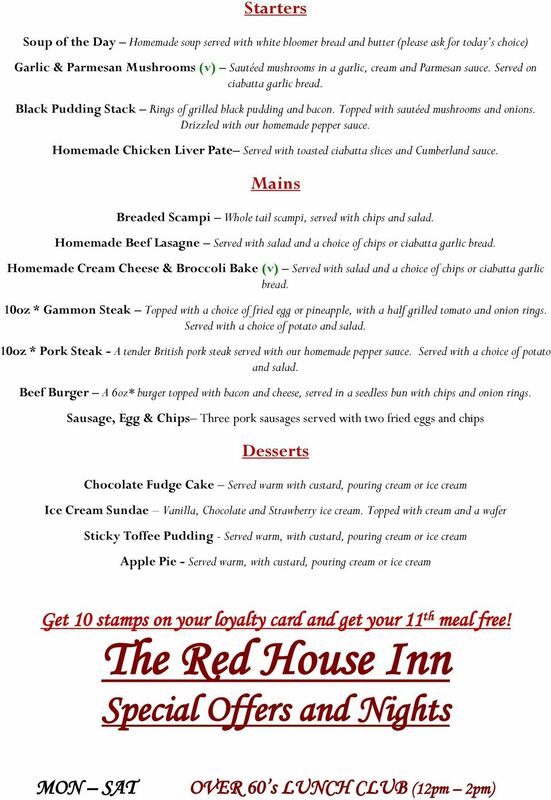 The Royal Inn Menu. Where ever possible ingredients are locally sourced and G.M. free. Starters. Baked King Prawns 6.50. Crispy Deep Fried Whitebait Bowl, Paprika Dusted 5.95. Tomato and Red Onion Bruschetta (v) (vg) 4. 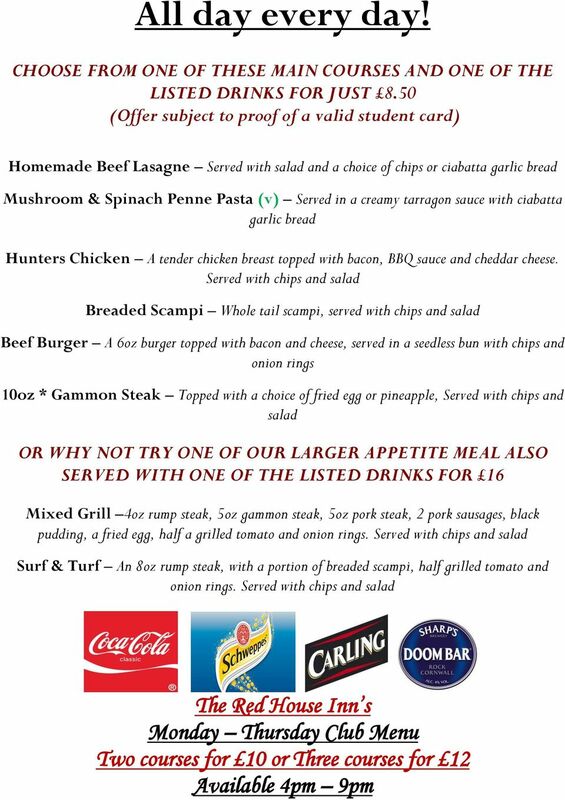 Montagu Bar Menu. 11am until 6pm. Soup and Sandwiches. Soup of the Day. Homemade Soup of the Day, Warm Bread, Ivy House Farm Butter. FOOD MENU. SIR ISAAC NEWTON Born January 1643 Died March 1727 WHO IS SIR ISAAC NEWTON? MENU MAINTAINING TRADITIONAL VALUES Every effort goes into sourcing fine local meats, fish, poultry, fresh fruit and vegetables. 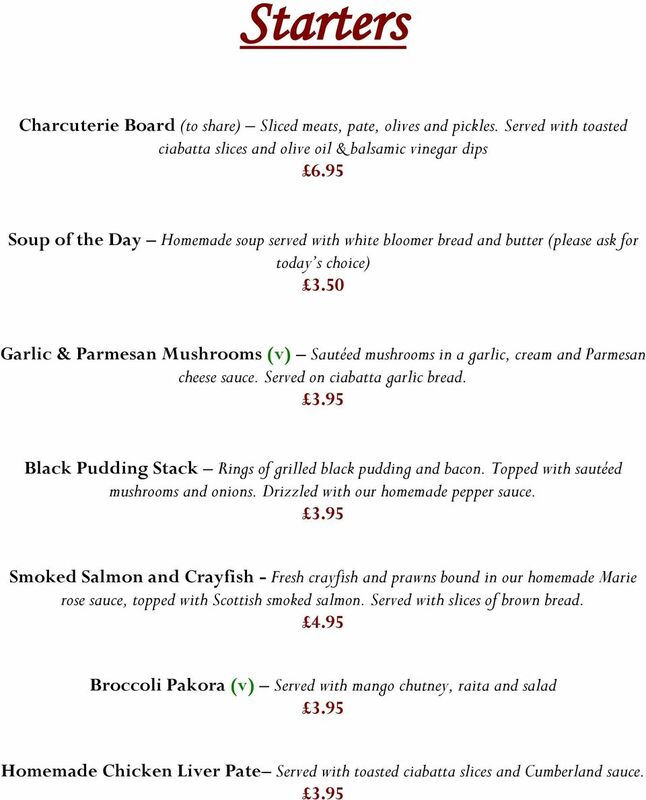 Our food is cooked to order so please be patient, especially at busy times. Evening Menu. 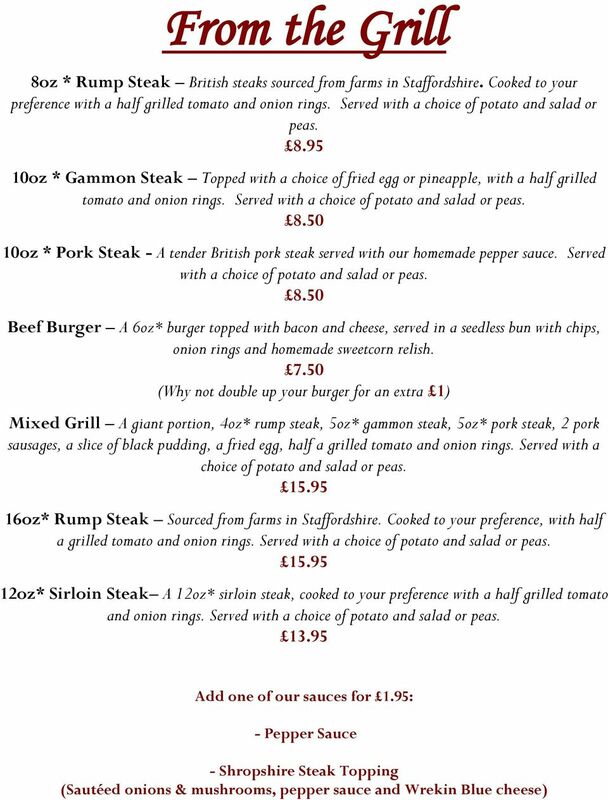 Why not try our sister restaurant Chill. THE TAP ROOM FOOD MENU:Layout 1 01/03/2011 08:54 Page 1 FOOD THE TAP ROOM FOOD MENU:Layout 1 01/03/2011 08:54 Page 2 Thank you for joining us at The Taproom. Please make your choices and order at the bar. Lunch Menu. 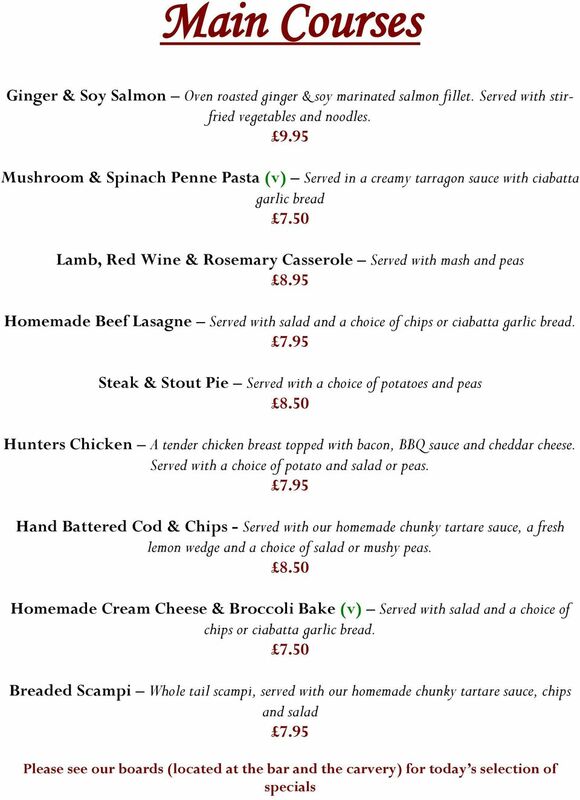 Including: Breads; Sandwiches; Salads & Side Orders; Starters; Main Meals; Burgers; Pizzas; Coffees; Liqueur Coffees. Congratulations on your wedding and thank you for choosing Portsmouth Guildhall as your venue choice. Fried Eggs on Toast free range eggs 3.75 with bacon 4.75 with sausage (veggie available) 4.95 with baked tomatoes and mushrooms 4. 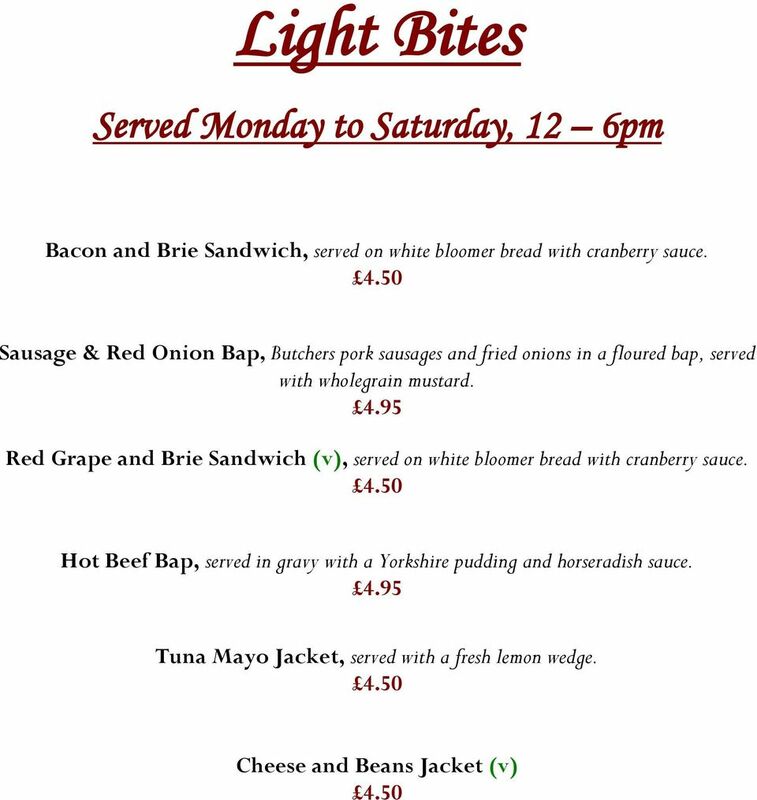 HAPPY HOUR MENU AVAILABLE: MONDAY - SATURDAY 12-2PM SUNDAY - THURSDAY PM FRIDAY & SATURDAY PM STARTERS 3.40. Children s Ward Menu WELCOME TO IMPERIAL COLLEGE HEALTHCARE NHS TRUST Please find enclosed your full guide to meals, drinks & snacks. Your hostess will take your lunch and dinner orders at your bedside. Hot Starters. Tempura of Seafood (Sharing plate) Selection of local seafood in tempura batter, wasabi mayonnaise & green salad 12. Weight of meat in raw state! Half portions served to children! Operator to pay the waiter only document from the cash register!